John Wilson is an artist with a worldwide reputation. 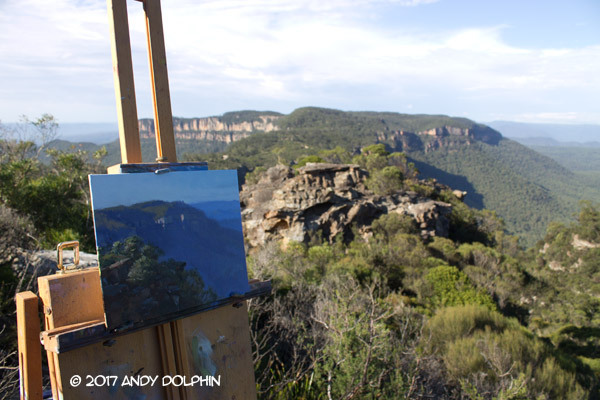 Based in the Blue Mountains, a couple of hours drive from Sydney, John has built a career on capturing the region in oil paint and last month I was lucky enough to find a spot in one of his 10-day masterclass workshops. It was an amazing experience as John gave students his recipe for "peaches and cream" and "apricot" and explained his use of foundational warm and cool greys. No questions went unanswered as John shared the knowledge borne from of his years of professional experience. Of the 10 days, three involved painting en plein air in some of the most beautiful places on earth. We painted from the Megalong Valley to the Capertee Valley and it was easy to see why so many artists are drawn to the region. I ventured out on my own, before and after class every day and on the weekend in the middle of the course, snapping hundreds of photos. 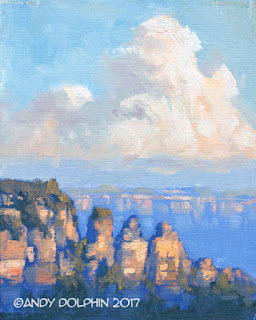 I also managed to do a few of my own paintings on the edge of the Katoomba cliffs. 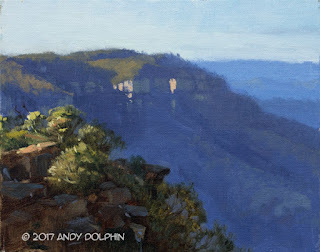 One of my more-successful attempts was painted one morning from a cliff face not far from the Sky Rider motel where I stayed. 25x20cm oil on canvas board. One thing you quickly learn here is to pay attention at the start and to cement the image in your mind because the light can change dramatically even in the short time it takes to do a small painting like this one. And here is the "proof I really was there" photo. As you can see in this photo, the dramatic shadow cast by the distant mountains in my painting was almost completely gone by the time I put down my brushes, less than one hour after I began. 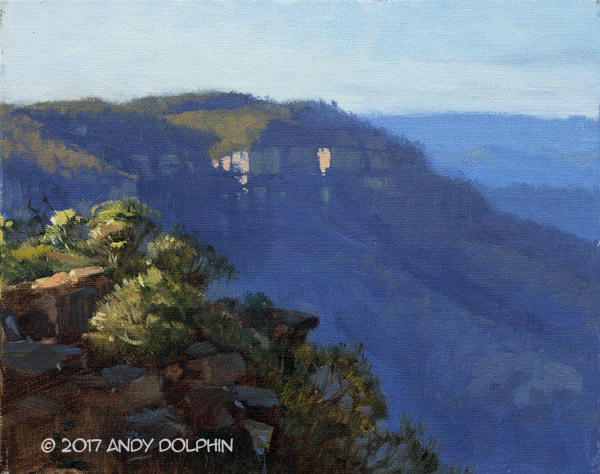 One evening I went to a small lookout just before sunset and decided to challenge myself to see just how fast I could paint something. I set about capturing the Three Sisters, arguably Katoomba's single-biggest natural attraction, as the light shifted rapidly with massive thunderhead clouds building all around and changing from bright fluffy white to rich, deep shades of orange and purple. The final painting took about 30 minutes, after which there was no sunlight on the cliffs and it was too dark to tell what colours I was mixing. 20x25cm oil on canvas board. As a painting, it leaves a little to be desired but as an exercise, I absolutely love it. Thanks John and Cecelia, and everyone who attended the workshop, for an inspirational two weeks with some great people. I hope to do it again soon. Nice work Andy keep them coming.